Combine the sugar and flour in a medium bowl and whisk them thoroughly together. Add the eggs and whisk smooth. Whisk in the coconut cream and vanilla. Cut the wedges of pineapple confit into 1/4-inch-thick slices and arrange them overlapping on the tart crust. Gently pour in the coconut cream, filling the crust only to within 1/4 inch of the top. 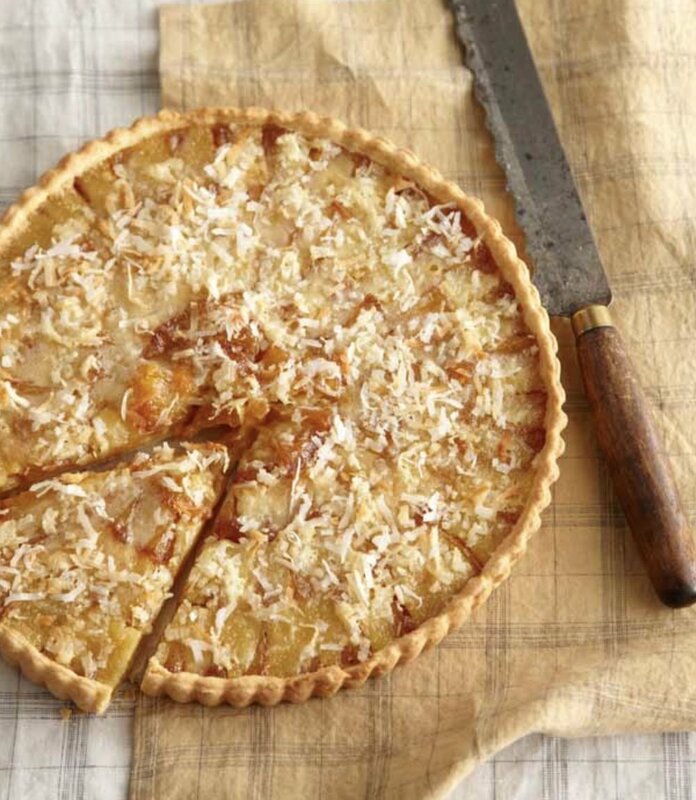 If the crust is too full, the coconut cream will overflow while the tart is baking. Sprinkle the top of the tart with the shredded coconut. Carefully transfer the tart to the oven. Bake until the crust is cooked through and the coconut cream has set, 30 to 40 minutes. Cool the tart on a rack. Unmold the tart and slide it onto a platter; serve it on the day it’s baked. If you live in Hawaii, you can buy a perfectly ripe, sweet pineapple, but most of us have to contend with ones that are underripe and lacking in sweetness. Several years ago, I experimented successfully with roasting pineapple before using it in a tarte tatin; this recipe takes the process a step further and adds some butter and sugar to enhance the pineapple’s flavor, with excellent results. Set a rack at the middle level in the oven and preheat to 300°F; if you have a convection setting, preheat to 275°F. Trim the top and bottom from the pineapple and halve it lengthwise. Cut each half into 4 long wedges, then trim the core and peel from each, being careful to cut away any eyes that remain on the skin side. Sprinkle the bottom of a small roasting pan with a third of the butter and a third of the sugar and arrange the pineapple wedges on it peeled side down. Sprinkle with the remaining butter and sugar. Bake the pineapple until it softens and starts to color a little, about 1 1/2 hours, using tongs to turn the wedges every half hour. Increase the temperature to 425°F (400°F convection) and continue baking the pineapple until the sugar caramelizes. Watch carefully to be sure the sugar doesn’t darken too much. Allow the pineapple to cool for a few minutes, then use tongs to transfer it to a shallow bowl. Place the pan over low heat and let the sugar start to melt. Add the water and use a silicone spatula to scrape up any caramel stuck to the pan. Let the juices reduce slightly and pour them over the pineapple. Cool the pineapple completely before using it. For the best flavor, refrigerate it before using.